Want to become intimate with beer? Join us for a day of hand harvesting our brewery grown hops, that will become part of our Estate Ale series, for a once a year oppurtunity. Please bring a long sleeve shirt, a hat and something to sit on. Children are more than welcome to attend, but we request that no pets assist with the picking. Depending on numbers, we hope to complete picking in 3 - 4 hours. A small lunch will be provided along with beverage refreshments, but you may want to brings some snacks, especially for the little ones. 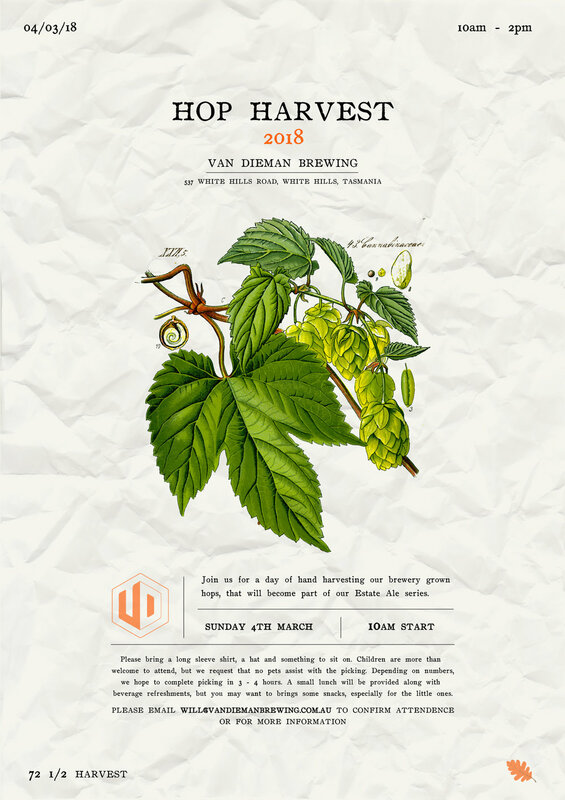 Pease email Will Tatchell (will@vandiemanbrewing.com.au) for any further information, & most importantly, please RSVP if you intend on assisting so we can gauge numbers and cater accordingly.